Determination lit all o’er her face. With her, day and night, they traverse! A little rash, choosy, moody and iffy! She now rules her worlds, dispensing deftly all affairs! Why can’t I have, what Shikha has? Demanded she her mother askance. Let my dreams drop like the feather! “Know the difference. Stop your cries. As if thrown to the rocks with the wisdom learned! I SHALL ACHIEVE WHAT I DO DREAM! Counting her goals, standing on total guard. She’s now game for the challenges vast! Yet Nagmani had triumphed, to victoriously set sail! Of infinity in every pore! And wisdom, like great Lakshmibai! Our salute to Infinite Courage! O Thunder and Lightning of this World! 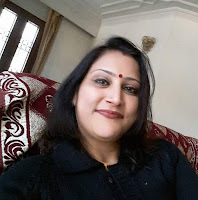 Dr. Poonam Nigam Sahay writes poetry bilingually in English and Hindi and loves to pen on Nature and Life particularly. She is an Associate Professor of English, actively guiding students for their doctoral thesis as well as M A/ M Phil dissertations. She has published widely in journals, nationally and internationally and has attended many conferences, inland and abroad. Some of her books are in press. She loves teaching and has a wide range of research interests - from Literature, Education, Linguistics to Poetry, Music and Painting. However, poetry reigns supreme amongst all as that is her passion and life.